To make the herb butter, mix the butter, mustard, and minced shallot in a medium-sized bowl, then stir in the parsley and chives. (This can be made days ahead and stored in the refrigerator. Prepare the coals for grilling. Rub the meat with the coarse salt and a bit of pepper. Oil the grill before laying on the steaks. Cook for about 6 minutes on each side for medium. 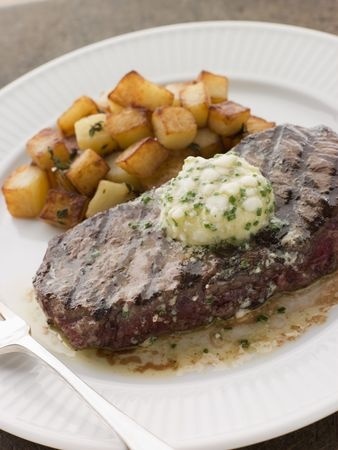 Remove steaks from grill and while the steak is still hot, dot with the herb butter. Let rest for 5 minutes then slice thinly on the diagonal, and arrange on a platter.